Are you working from home? Be it part time or full time, this kind of arrangement requires you to have some self discipline in your routine, or else you'll find yourself wasting time in your bedroom or on the sofa binge watching Netflix instead of actually doing something productive. Hey! 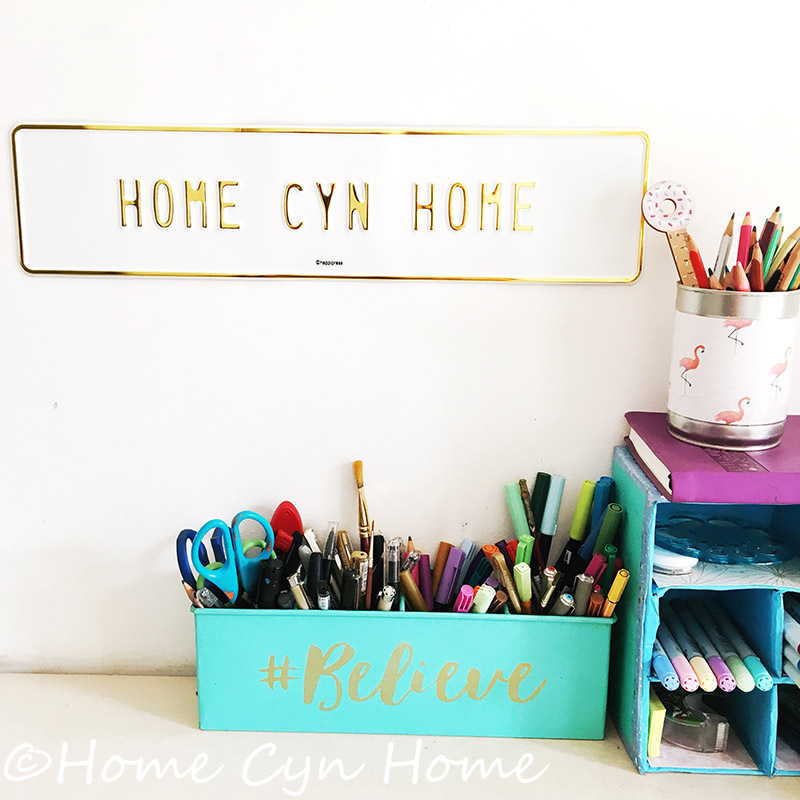 These days happen to the best of us, and take it from a girl who hasn't set a foot in an office since 2005, how you treat your home office space makes a HUGE difference in your productivity. I am blessed enough to be able to have a full room dedicated to just work, we actually call it "The office" and that is where both hubby and I do anything work related. I work in there most of the day, he pulls a few hours on some nights after coming home from work, so this is a space that is absolutely vital in our life. That said, space and money can be a massive constraint to many, and it's OK not to have a full room dedicated to your work life at home. You can just as well set up a corner and make it a point to work only from that spot. Identify an area that would host a small desk first. It can be in a corner of your bedroom, or in the living room, but demarcate that spot very clearly. Resist the siren call of setting up your work on the dinning table or the coffee table in your living room. It might look like the easiest way, but it's also going to be the most distracting. Why? Because if you set up shop on your dinning table, that means you'll end up clearing everything away each meal time, and will lose a lot of time setting up your workspace all over again. 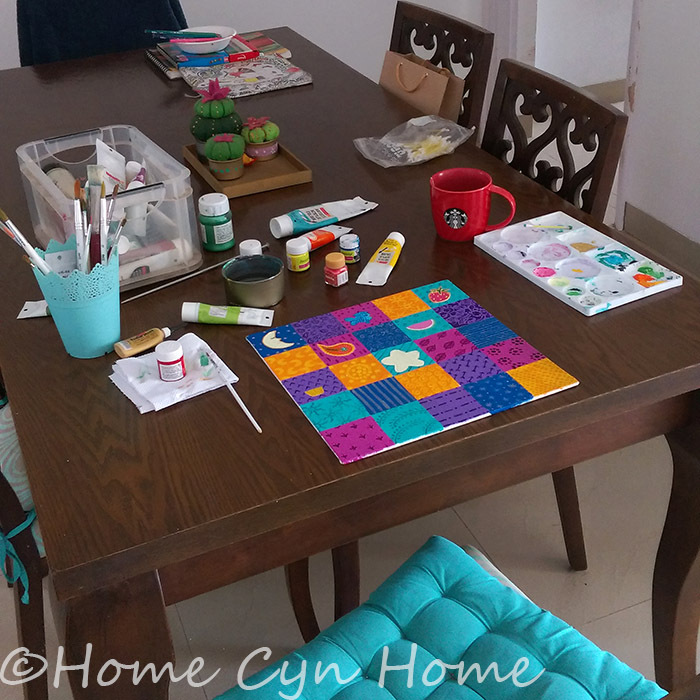 It's far from ideal, and neither I nor my family enjoy eating in the company of paint tubes and brushes, so all that has to go each time lunch or dinner time strikes. Don't get me started just yet about the sitting arrangement or the light. You might be able to pull it off if your work only requires you to work from a laptop, but mentally, a part of you will always treat what you are doing less seriously because it's not a dedicated WORK space. The coffee table is even more dangerous, because it's usually in close proximity to the TV and the temptation to switch it on will be far too great. As a rule, try to set up your work station as far from a TV or source of constant distraction as possible. I always pick a spot with lots of natural light for my desk, because when you are an artist, good light matters when you draw and paint the whole day. This was a way to not need artificial lighting until sunset, and the pretty garden view outside did boost my morale on thought days. I our current flat, the desk is pushed against a nice white wall, but the room gets oodles of bright natural sunlight because it has a big South facing balcony glass door. Natural light is one thing, but you need to make the proper arrangement for night time, if you are a creative entrepreneur, or well any kind of entrepreneur, chances are you WILL pull a few late nights at home. I know I try to avoid it, but it's not always possible, and on those days, I need the light to shine bright on my desk. The biggest mistake you can make in the light department, is really on those harsh, sterile tube lights that seem to be a fixture in most Indian homes. These lights are the WORST first they cast a ghastly white light all over the room, but do not even bring that much brightness where you need it the most : your desk. Then like most white lights, they disrupt your melatonin production and mess up your sleep cycles in the long run. And last but not least, if you are sensible to it, the pulse of the tube light will give you a headache. In general, avoid a single source of light in your workspace, especially a source that comes from the ceiling or close to it and favour a strong warm white (yellow) light source close to you. Notice the reading lamp on my desk in the picture above? It's a fairly inexpensive light I found on Amazon (it's an affiliate link by the way). I paired it with a strong warm light bulb. If I remember well it's a 40w tornado CFL bulb that give the same light intensity as a 100w incandescent bulb. It means it's super bright yet the light is warm enough not to disrupt my sleep cycles or give me a headache. Plus trust me, if you are an artist, that damned white light most tube light emit will mess up your colors perception, you don't need that. I avoid doing coloring work after night time, but sometimes I need to, and I have less issues working by a strong warm white light than a tube light. It sounds stupid, but having everything you need to work in the same room or same area is key to productivity. If you end up constantly standing up from your desk to fetch a paper, print something, scan something, pour yourself a glass of water, check a book, you'll end up not only loosing precious time, you also increase the chances of getting distracted. Not convinced? Let me share a little story with you guys. In my previous flat, I made the huge mistake of not keeping my most commonly used paints and art supplies in the office. They were all in a chest of drawer in the living room. The living room and my office were separated by a long narrow hallway that passed in front of my kitchen door. I lost the number of time I realised I was missing something from my art supplies stash, walked to the living room to retrieve it, only to be distracted by the mess on the coffee table, or a pile of dishes in the kitchen, and instead of spending 30 seconds to grab a paint palette, I would end up waisting 30 straightening the rest of the flat, then feeling exhausted and ending up on the sofa, only to watch something on TV. It's that easy loosing focus folks! So make sure that your workspace has all the tools you need. 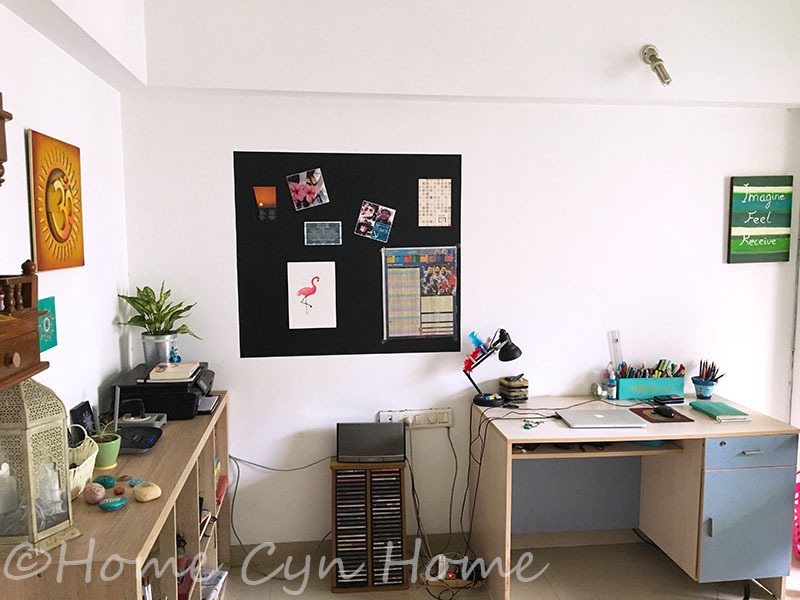 If you can only dedicate a corner of your room to act as your office, have a carpenter fix floating shelves above your desk, have a filing cabinet on the side of your desk to keep all your important papers and act as a printer/scanner stand. Simply put, maximise the storage space in that area. You have no idea the amount of real estate that is usually wasted on your walls. In tiny spaces, it pays to go vertical rather than horizontal with storage. 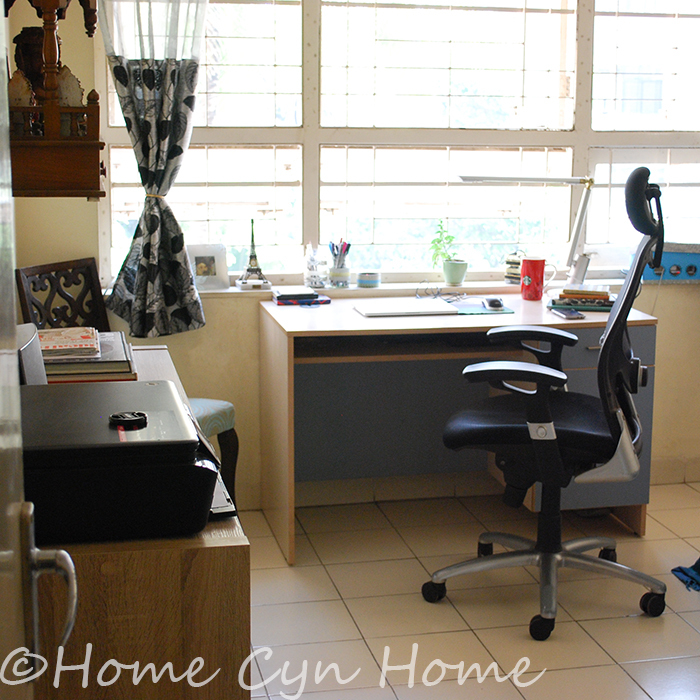 Pinterest is full of ideas to set up a tiny home office space, make use of it. The advantage of working from home, is that you can set up and decorate your home office space the way you like without having to deal with your boss or co-workers retraining you or raising an eyebrow at your collection of bobble heads figurines. So, as important as storage and having everything within reach, make sure there is some room for your personality to shine through. As you all know, my work space is my creative boosting space, and as a color loving artist, this room needs to reflect that. While my desk is cluttered with notebooks, and art supplies on a daily basis, I do have a way to organise them. 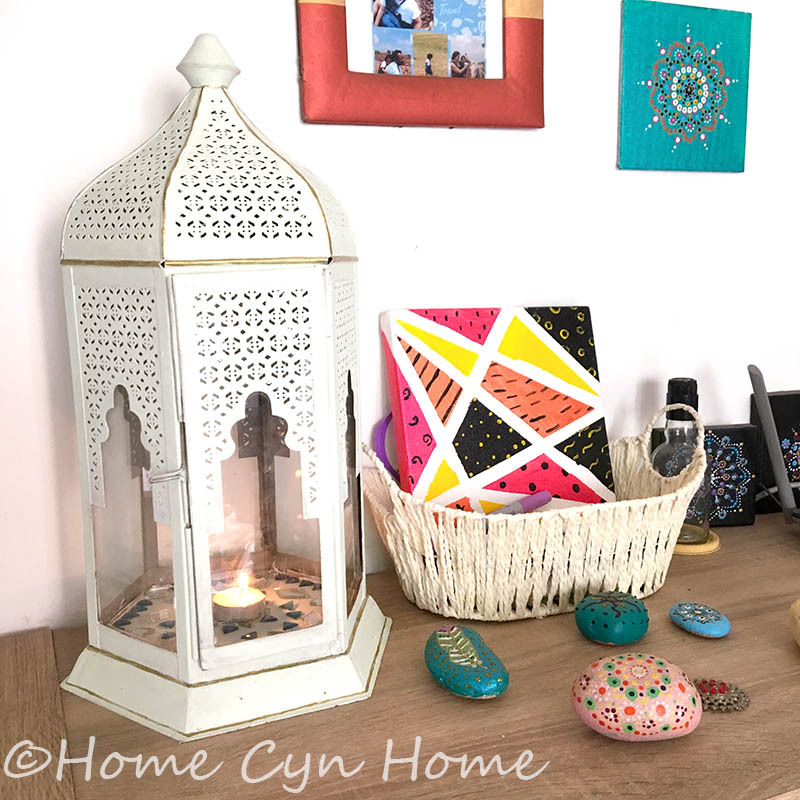 I have that super favourite pen holder from Elan in the picture above that not only looks neat, but also reminds me to BELIEVE, even when I feel down and discouraged on some days. More recently I fashioned a horizontal storage shelf for my Copic markers out of cardboard box, and used a tin can I wrapped in my flamingo pattern to hold more pencils. I have a big bookshelf in that room which hosts all my art supplies and books in the cubbies, but I kept the top mostly decorative (it does get messy at time though). Because, even if I get messy, and most creatives do, a room stacked up with papers and supplies can get pretty suffocating. Having your eyes being able to rest on an oasis of serene decor in your work space is essential to stay productive. You already know why the TV in your workspace is a bad idea, but that is not the only thing that can sabotage your productivity. You phone is likely to be as huge a culprit (if not more). I wrote a post about unplugging yourself to stay productive. And I kid you not, I turn off all notifications on my phone, on most days it is even on mute, because having a MacBook and an iPhone, I am still guaranteed to be notified about incoming calls if I work on said laptop. I really do not need the constant bleep bleep of WhatsApp alerts, and Facebook messages. In fact, I recently killed Facebook messenger on my phone. Why? Because seriously, I do not owe it to anybody to be constantly reachable at all time. Between 9am and 5pm I am at work, the cute kitty pictures, the "pass this lucky charm to all your contacts or you'll be doomed" messages are simply NOT WORTH MY TIME. Another common home office distraction is the outdoor noises, if you live by the side of a busy road like I do, close that balcony or window and resist the urge to go peep each time someone is shouting outside...like Facebook messenger, it's not worth your time. If you can't work without background noise, build yourself a mood boosting music playlist, there are plenty of options you can download. Favour music without lyrics though, singing and dancing along your favourite tunes the whole day long is not going to do much for your productivity. Nobody can work 8 hours straight, so do take breaks in your day, simply not in front of the TV. The best is to just step outdoors, go for a walk, have lunch outside at least once a week just because. And if you feel that mid-day slump coming, head to the bedroom and take a 20-30 minutes power nap. If you feel frustrated with a specific task, just set it aside, and focus your attention on something else instead. I myself have days during which drawing or painting is a drag, so I focus on either doing some editing work, or take an online class, or read something that is related to my business and vision, or jot down ideas in a notebook until the energy to get creative is back. Remember that you'll always have days of low productivity, and working from home offers you a lot of flexibility you cannot have in a conventional workplace, just use that flexibility wisely, and stick to a routine that works for you.